While the lunar eclipse from two weeks ago corresponded with the bottom of the current long dip in the price of Bitcoin, the impending corresponding solar eclipse seems to suggest a different story. Instead of the generally negative astrology of the past eclipse, we have mixed signals, perhaps leaning towards the positive. 1. Eclipse or no, either the Sun or Venus forming an aspect to Bitcoin's Venus has tended to correspond with a temporary price spike. Here we have both, in a wide conjunction with the North Node. 2. 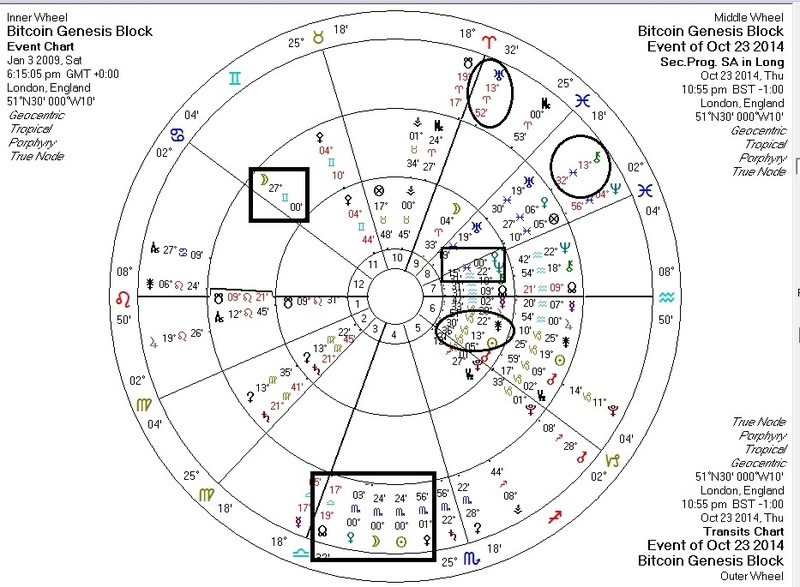 Said Sun-Venus conjunction is trine Bitcoin's progressed Moon. 3. Setting aside Bitcoin's chart, the Sun-Pallas conjunction is good for "libertarian-positive" news. 1. The transiting South Node, which could be re-triggered by the eclipse, is still on Bitcoin's MC. I am leaning towards the idea that most of the action will occur on the closer to where the actual eclipse is on the chart, however. 2. Transiting Chiron is near-exactly sextile to Bitcoin's Sun. Chiron has consistently been bad news for Bitcoin's price. Then again, it's only a sextile. 3. Uranus is square Bitcoin's Sun: this is not inherently positive or negative but certainly could be disruptive. Uranus could be triggered by a quindecile from the eclipse. I offer no advice or guarantee, but I am expecting price activity on/around Thursday. Probably, it'll be some kind of price peak or spike. October 24, 2014 at 9:13 AM Price activity, yes. But downward. Next time, I'll know not to discount the South Node in a North Node solar eclipse.